Stained glass is an extremely durable material, made up of glass tinted with paints, pigments, and dyes. This means it is the perfect medium for adorning churches and to give it an ethereal feel. However, simply because stained glass is durable, does not mean it never needs to be restored. The truth is, church stained glass windows should be repaired or restored every 80-100 years. If your church houses stained glass and you wonder if it may soon need repair, we can help you decide with our guide below. 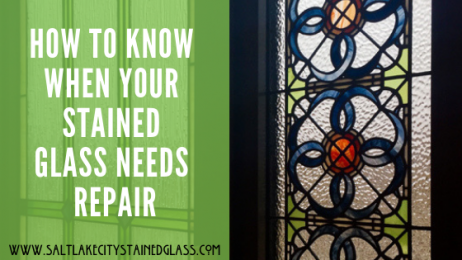 Read on to find out the surefire signs of disrepair to look for on your chapel’s stained glass and how you can keep it looking lovely and intact for your congregation for the next generation. An obvious sign it is time to have a restoration done on your Salt Lake City church stained glass are gaps of visible light through the frame, leading or glass pieces. Whether large or small they must be addressed because the reason these gaps appear is that the lead is stretched and structurally unsound. So, the surrounding glass panels are no longer held securely in place. The possibility of a piece of glass falling out of the window is likely and stained glass professional should be brought in to take a look. If the stained glass windows in your church are buckling, bowing, bulging or sagging, your windows are at risk of collapsing. This, of course, is a worst case scenario but not unheard of. Any falling glass is bad glass and if it falls onto parishioners could easily harm them. This type of damage is not from the glass decaying but rather the wood frame, expanding and contracting over time. This type of movement causes the frame to lose strength as well as taking a big toll on the lead causing it to lose strength as well. This is an issue that needs to be repaired soon to immediately by a professional. The most common repair to church stained glass windows (and the least “dangerous”) are to chips and cracks in the glass. It is a fix that is not pressing but rather, affects the beauty and luster of your church’s stained glass. Keep in mind that cracks could also be indicators of “stress zones” in the glass–pointing to a failing frame. So, if you notice cracks getting bigger or increasingly popping up, contact a professional stained glass repair company like us at Salt Lake City Stained Glass.